Sliding glass doors are undoubtedly a good investment for your home. Beyond improving aesthetics, they add functionality by creating or improving access between two areas. Despite this, glass panel doors can be a costly mistake if you choose the wrong model or fit. It is important to bear in mind several factors before you choose your doors. Whether you are seeking glass doors that will improve access to an outdoor space or interior glass walls to divide a room into different sections, you need to ensure the doors are safe and secure. Look for glass doors with a reliable locking system. For instance, exterior doors should lock from the inside only. Next, consider the quality of the glass. It should be strong, to prevent breakages, but also shatterproof. In the case of an accident or vandalism, shatterproof glass breaks into large chunks rather than small shards that can cause an injury. Tempered glass is the best option, as it is both stronger than regular glass and shatterproof. Plus, tempered glass often reduces noise. Not only can this lead to a quieter home environment, it also allows you to play loud music in your home without disturbing your neighbors. Finally, choose sliding glass doors that cannot be lifted from their tracks. This will create an effective barrier against intruders, protecting you and your family. 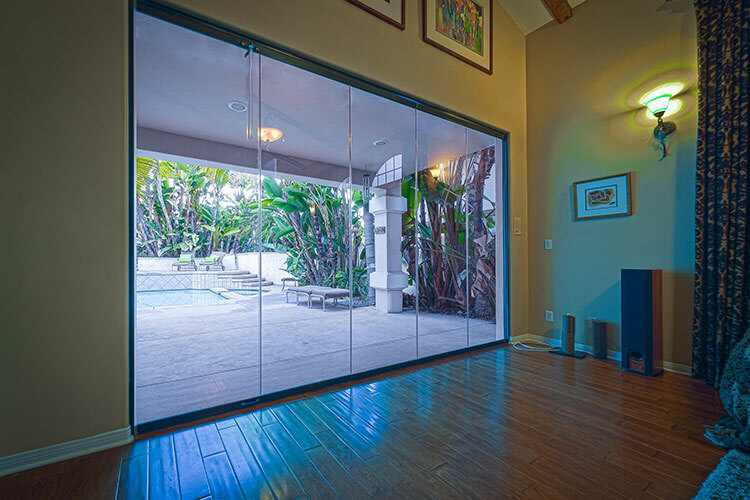 Sliding glass doors are a great option for improving the appearance of your home. Unlike French doors, they have no vertical frames to interrupt your view and take up only a minimal space when open. Frameless glass doors are the the best of all, as they feature glass panels and nothing more. To maximize aesthetics, choose a model with recessed tracks, creating a seamless transition between two spaces. Just because Southern California has a fair climate most of the year is no excuse to ignore weatherproofing. If you are looking for exterior doors, you will need to plan for occasional rainfall. Choosing sliding glass doors that seal well against the elements will stop damp and wind entering your home. Pick a sliding glass door system with proper drainage in the tracks to ensure your home always stays dry in wet weather. Sliding glass can be more than just a luxury for now — turn them into a long-term investment by choosing a model that will add value to your home. Some types of glass doors are more appealing than others to potential property buyers. Look for models that will improve your living area but also allow future homeowners to adapt the space to their needs and lifestyle. Frameless sliding doors are ideal for this. Frameless glass doors can also help you sell your home by enhancing views. You can be sure the stunning view will be first thing prospective buyers notice. There are plenty of models that fulfill all the above criteria. To gain the maximum benefits from your sliding glass doors, never settle for less.